The game, unlike rpgKids (which is basically a rule toolbox), takes place in the world of Cielous, a sky world dotted by islands floating in a crimson sky, lit by a never-ending dawn due to its three suns that are always setting and rising. 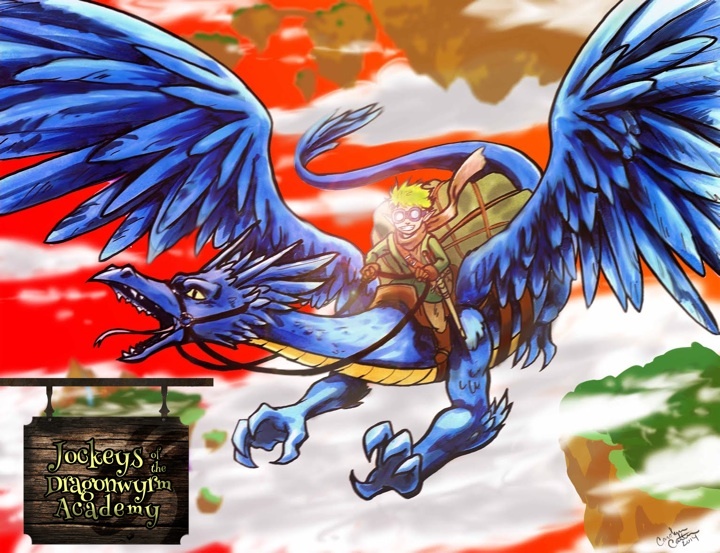 The people that inhabit the islands, the Triddles, need to ride and use dragons to get around from island to island, but unfortunately due to events that happened at the beginning of time, dragons only trust kids. They don’t let adults ride them. So kids are taught (by former riders) at the Dragonwyrm Academies to train and ride the dragons. That’s the core idea and premise of the game. I also created a mechanic for the game that ties into the story of the setting, further making the story an important part of the experience. The rules are more open ended. I’ve taken a look at a lot of different systems over the past few years. Things like Fate and Fate Accelerated, 13th Age, Edge of the Empire, Fiasco, BECMI D&D, and some others all have inspired me to think beyond the d20 system for inspiration. 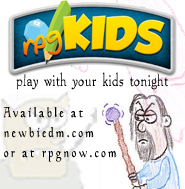 It’s easy to see the D&D inspiration that led to rpgKids. JotDA has more in common with these other systems instead. Character creation is very open ended, for example. There are no classes, and a player can literally make a character that’s good at whatever the player wants it to be. If she wants to be good at Swordfighting, Basket weaving, and Singing, she can. Players are only limited by their imaginations. There is minimal number crunching at character creation. In fact, there are only three stats in the game (apart from health/defense). I think this will appeal to kids, since they can really be any type of character they can think of. Combat will be a bit more abstract than rpgKids was, taking cues from games like 13th Age and Edge of the Empire. if you’ve played those games, you know the angle JotDA is going for… fast, loose and fun. No more counting 5 squares to see if a slingshot hits or not. I think this makes the game and story easier to get immersed in. But the system is designed to not just be able to resolve combats, and the same core mechanic will allow for problem solving and other challenges, which is part of the design philosophy I want to follow for adventure building and design. No more room upon room of combats a la 4e, the adventures will have the Jockeys taking part on other types of adventures as well. The system uses a simple 3d6 resolution system. I like d6’s because they are very common and are easy to design with. So there’s a bit more info about JotDA. I hope those of you who were aboard the rpgKids ride give this one a shot, I think you’ll like it. Here’s some preview art to get you excited!